Excavation showing soil contamination at a disused gasworks. Soil contamination or soil pollution as part of land degradation is caused by the presence of xenobiotic (human-made) chemicals or other alteration in the natural soil environment. It is typically caused by industrial activity, agricultural chemicals, or improper disposal of waste. The most common chemicals involved are petroleum hydrocarbons, polynuclear aromatic hydrocarbons (such as naphthalene and benzo(a)pyrene), solvents, pesticides, lead, and other heavy metals. Contamination is correlated with the degree of industrialization and intensity of chemical usage. The concern over soil contamination stems primarily from health risks, from direct contact with the contaminated soil, vapors from the contaminants, and from secondary contamination of water supplies within and underlying the soil. Mapping of contaminated soil sites and the resulting cleanup are time consuming and expensive tasks, requiring extensive amounts of geology, hydrology, chemistry, computer modeling skills, and GIS in Environmental Contamination, as well as an appreciation of the history of industrial chemistry. In a wider sense, genetically modified plants (GMP) can count as a risk factor for soils, because of their potential to affect the soil fauna. 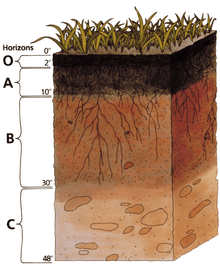 Any activity that leads to other forms of soil degradation (erosion, compaction, etc.) may indirectly worsen the contamination effects in that soil remediation becomes more tedious. In the European Union, the Urban Waste Water Treatment Directive allows sewage sludge to be sprayed onto land. The volume is expected to double to 185,000 tons of dry solids in 2005. This has good agricultural properties due to the high nitrogen and phosphate content. In 1990/1991, 13% wet weight was sprayed onto 0.13% of the land; however, this is expected to rise 15 fold by 2005. Advocates say there is a need to control this so that pathogenic microorganisms do not get into water courses and to ensure that there is no accumulation of heavy metals in the top soil. 1. Organochlorines include DDT, Aldrin, Dieldrin and BHC. They are cheap to produce, potent and persistent. DDT was used on a massive scale from the 1930s, with a peak of 72,000 tonnes used 1970. Then usage fell as the harmful environmental effects were realized. It was found worldwide in fish and birds and was even discovered in the snow in the Antarctic. It is only slightly soluble in water but is very soluble in the bloodstream. It affects the nervous and endocrine systems and causes the eggshells of birds to lack calcium causing them to be easily breakable. It is thought to be responsible for the decline of the numbers of birds of prey like ospreys and peregrine falcons in the 1950s - they are now recovering. As well as increased concentration via the food chain, it is known to enter via permeable membranes, so fish get it through their gills. As it has low water solubility, it tends to stay at the water surface, so organisms that live there are most affected. DDT found in fish that formed part of the human food chain caused concern, but the levels found in the liver, kidney and brain tissues was less than 1 ppm and in fat was 10 ppm, which was below the level likely to cause harm. However, DDT was banned in the UK and the United States to stop the further buildup of it in the food chain. U.S. manufacturers continued to sell DDT to developing countries, who could not afford the expensive replacement chemicals and who did not have such stringent regulations governing the use of pesticides.. Contaminated or polluted soil directly affects human health through direct contact with soil or via inhalation of soil contaminants which have vaporized; potentially greater threats are posed by the infiltration of soil contamination into groundwater aquifers used for human consumption, sometimes in areas apparently far removed from any apparent source of above ground contamination. This tends to result in the development of pollution-related diseases. Health consequences from exposure to soil contamination very greatly depending on pollutant type, pathway of attack and vulnerability of the exposed population. Chronic exposure to chromium, lead and other metals, petroleum, solvents, and many pesticide and herbicide formulations can be carcinogenic, can cause congenital disorders, or can cause other chronic health conditions. Industrial or man-made concentrations of naturally occurring substances, such as nitrate and ammonia associated with livestock manure from agricultural operations, have also been identified as health hazards in soil and groundwater. Thermal remediation by introduction of heat to raise subsurface temperatures sufficiently high to volatize chemical contaminants out of the soil for vapour extraction. Technologies include ISTD, electrical resistance heating (ERH), and ET-DSPtm. The immense and sustained growth of the People's Republic of China since the 1970s has exacted a price from the land in increased soil pollution. The State Environmental Protection Administration believes it to be a threat to the environment, to food safety and to sustainable agriculture. According to a scientific sampling, 150 million mi (100,000 square kilometers) of China’s cultivated land have been polluted, with contaminated water being used to irrigate a further 31.5 million mi (21,670 km2.) and another 2 million mi (1,300 square kilometers) covered or destroyed by solid waste. In total, the area accounts for one-tenth of China’s cultivatable land, and is mostly in economically developed areas. An estimated 12 million tonnes of grain are contaminated by heavy metals every year, causing direct losses of 20 billion yuan (US$2.57 billion). It is intended that the SGVs replace the former ICRCL values. It should be noted that the CLEA SGVs relate to assessing chronic (long term) risks to human health and do not apply to the protection of ground workers during construction, or other potential receptors such as groundwater, buildings, plants or other ecosystems. The CLEA SGVs are not directly applicable to a site completely covered in hardstanding, as there is no direct exposure route to contaminated soils. In March 2009, the issue of Uranium poisoning in Punjab attracted press coverage. It was alleged to be caused by fly ash ponds of thermal power stations, which reportedly lead to severe birth defects in children in the Faridkot and Bhatinda districts of Punjab. The news reports claimed the uranium levels were more than 60 times the maximum safe limit. In 2012, the Government of India confirmed that the ground water in Malwa belt of Punjab has uranium metal that is 50% above the trace limits set by the United Nations' World Health Organization. Scientific studies, based on over 1000 samples from various sampling points, could not trace the source to fly ash and any sources from thermal power plants or industry as originally alleged. The study also revealed that the uranium concentration in ground water of Malwa district is not 60 times the WHO limits, but only 50% above the WHO limit in 3 locations. This highest concentration found in samples was less than those found naturally in ground waters currently used for human purposes elsewhere, such as Finland. Research is underway to identify natural or other sources for the uranium. ↑ George, Rebecca; Joy, Varsha; S, Aiswarya; Jacob, Priya A. "Treatment Methods for Contaminated Soils - Translating Science into Practice" (PDF). International Journal of Education and Applied Research. Retrieved February 19, 2016. ↑ Agarwal, A.; Liu, Y. (2015). "Remediation technologies for oil-contaminated sediments". Marine Pollution Bulletin. doi:10.1016/j.marpolbul.2015.09.010. ↑ Facing up to "invisible pollution"
↑ Yadav, Priya (2 April 2009). "Uranium deforms kids in Faridkot". The Times of India. ↑ Jolly, Asit (2 April 2009). "Punjab disability 'uranium link'". BBC News.